So the biggest change to the primary is the removal of most of the black. The sidepanels have also been removed and the red and green stripes made equal width. As with most of the old Sydney clubs I’ve gone with a mock traditional collar and the primary sponsor has been split between two stripes which is about as good as sponsor integration will get in this case. The shorts are kept black as they should be but with a red and green split pinstripe down the side to add some colour. The secondary is a modification of the primary in that alternating double hoops are replaced with white to give a predominantly white jersey. The sponsor is coloured so that each line matches the hoop missing from that spot. The retro is the minties jersey (short sleeve version) with the correct shorts, socks and logo. You know what graphic this club needs? A Rabbitoh! It might stop people calling them the ‘Bunnies’ if people knew what a rabbitoh actually was. Its a 1890s depression era rabbit seller, with red blood and green guts on his shirt hollering ‘Rabbitooooohh! !’ through the streets of South Sydney. Not to replace the rabbit, but as a secondary logo. Although it would make the term clearer, I don’t see the club marketing logo which has a bloodied man with dead rabbits slung over his shoulder. The Dragons aren’t too dissimilar in that the Dragon is overshadowed by St. George in the background. Looks like Best & Less borrowed the away strip for 2014 merchandise. 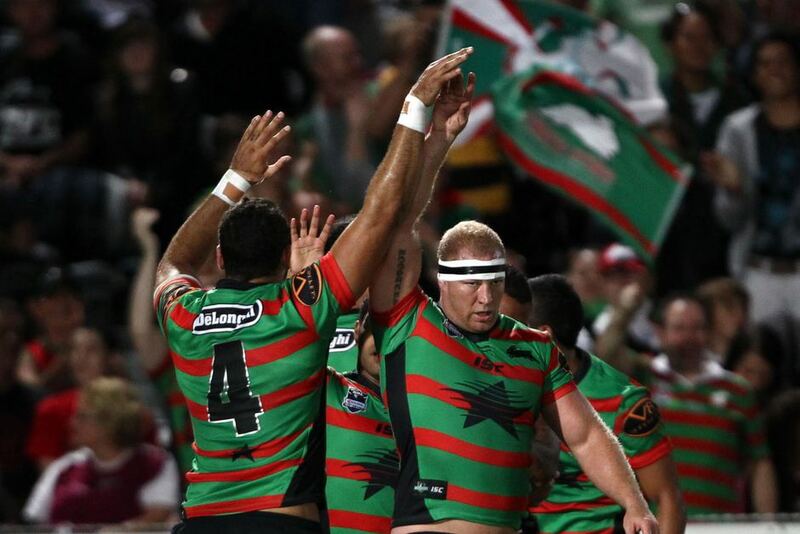 Gaz, I think the width of the stripes is an issue with Souths. Equal width Red and Green is appalling to look at on TV or at a distance. Having thicker Green stripes makes sense. But I agree entirely wrt the white and black. And get a proper away design Souths.